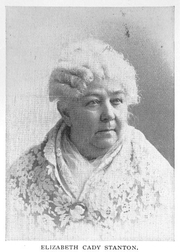 Elizabeth Cady Stanton (1815-1902), Buffalo Electrotype and Engraving Co., Buffalo, N.Y.
Elizabeth Cady Stanton was a pivotal figure in the USA abolition and women's rights movements. She campaigned for many broader issues important to women beyond the right to vote, including parental and custody rights, divorce, property rights, employment, role in society, health, and and birth control. With Lucretia Coffin Mott, she organized the first Women’s Rights Convention held in Seneca Falls, New York, in 1848. Her published works include The History of Woman Suffrage (6 volumes, 1881-1922), written with Susan B. Anthony and Matilda Joslyn Gage, and her daughter Harriot Stanton Blatch working on the second volume; The Solitude of Self (1892); The Woman's Bible (1895-1898); and her autobiography, Eighty Years & More (1898). Elizabeth Cady Stanton is currently considered a "single author." If one or more works are by a distinct, homonymous authors, go ahead and split the author. Elizabeth Cady Stanton is composed of 3 names. You can examine and separate out names.